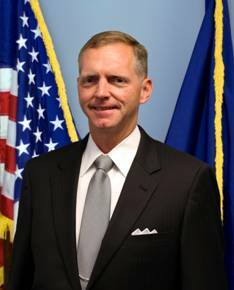 John D. Murphy is the Chief, Programs and Plans Division. (click image for John's Biography) In this role, he manages the execution of program management and development of programs while accessing science and technology options. He prepares solutions and develops plans to meet service requirements, and plans, coordinates, and manages the technology infusion program. He identifies and monitors objective measures of program progress. The Science Plans Branch of the Programs and Plans Division defines, plans and supports the execution and implementation of science activities needed to improve NWS products and services. The Program Management Branch staff handle technology insertion and program improvement acquisitions. Key Branch functions include program control, planning and development, budgeting and resource management, scheduling, and the production of reports and metrics. Personnel include Program Analysts, Schedulers, Contracting Office Technical Representatives (COTR) and Program Support personnel who function as Assistant Program Managers. COTRs and support personnel provide specialized services in Integrated Logistics Support Planning, Quality Assurance and Testing, and Deployment/Implementation Planning. AWIPS is the engine running NWS Weather Forecast Office operations. AWIPS provides an efficient and effective means for forecasters to prepare and issue timely, accurate forecasts and warnings. AWIPS is an interactive computer system that integrates all meteorological, hydrological, satellite, and radar data into one computer workstation. AWIPS allows forecasters the interactive capability to view, analyze, combine, and manipulate large amounts of graphical and alphanumeric weather data. The AWIPS communication network also consists of a wide area network (WAN), i.e., a high speed data network of terrestrial communications lines. This network allows two-way, point-to-point communications among AWIPS sites for the exchange of data and products which are locally produced. AWIPS product improvement programs are defined in the AWIPS Development and Technical Refresh budget/programming line items. Key Programs are completion of AWIPS Build 5 in FY02, which basically completes the AWIPS development phase, Linux System Upgrades, which vastly improve system performance capabilities, and Technical Refresh activities which begin in FY04. NEXRAD comprises approximately 160 Weather Surveillance Radar including 1988 Doppler (WSR-88D) sites throughout the United States and selected overseas locations. NEXRAD is a state-of-the-art, automated signal processing, pulse Doppler weather radar system. NEXRAD provides its principal users--the National Weather Service, the United States Air Force and Navy, and the Federal Aviation Administration, with a wide array of weather data and products information which are critical for severe weather warnings and the protection of lives and resources. This data include early warnings of hazardous weather such as severe thunderstorms, hail, tornadoes, and blizzards; flash flood predictions, and general weather forecasts to ensure flight safety, water resource management, and protection of resources on military installations worldwide. The budget/product line NEXRAD belongs to is Next Generation Weather Radar Product Improvement (NEXRAD PI). Focus of efforts is to move towards a more open system environment; improve maintainability, reliability, performance; and to rapidly infuse new science capabilities. With the completion of the Open Radar Processor Group (ORPG) program in FY02, Open Radar Data Acquisition (ORDA) development is ongoing through FY 05 with Dual Polarization programmed for the next upgrade. New science is scheduled to be infused every six months. ASOS serves as the nation's primary surface weather observing network. ASOS is designed to support weather forecast activities and aviation operations while, at the same time, supporting the needs of the meteorological, hydrological, and climatological research communities. With the largest and most modern complement of weather sensors, ASOS has significantly expanded the information available to forecasters and the aviation community. ASOS works non-stop, updating observations every minute, 24 hours a day, every day of the year. One program included in the ASOS system is the Lightning Data Program (LD). The LD program provides the National Weather Service and other Federal agencies the required lightning data and information to support their operations and forecast product development. The LD program provides information which assists the issuance of convective weather watches, warnings, advisories, and statements. Lightning data is also used in aviation planning and operations to avoid high convection and lightning active areas. Future LD developments plan to improve lightning data and products which will advance storm prediction, tracking, and thunderstorm warning times. The budget/product line ASOS belongs to is Automated Surface Observing Product Improvement (ASOS PI). Staff work to improve maintainability and reliability and to acquire new sensing capabilities for improved severe weather observations, forecasts, and warning support. The initial effort critical to all sensor upgrades is the main processor (ACU) replacement. The new processor and software correct numerous reliability and maintainability problems and are necessary for new sensor development. New sensor upgrades/replacements include the Dew Point (FY02), Ice Free Wind (FY 02/03), All Weather Precipitation Accumulation Gauge (FY03), and Enhanced Precipitation Identifier (FY04/05). Others (i.e., ceilometer) are in plan development. The NWS has designated the Voice Improvement Program (VIP) to select new, improved automated voices for NOAA Weather Radio (NWR) recordings. These voices are more understandable and human-sounding. Automated voices help NWS deliver warnings, watches, forecasts, and other hazard information more quickly and accurately. After months of evaluating voice technologies and receiving public input, NOAA has awarded Siemens Information and Communication Network a contract to provide software that combines phonetic sounds with natural language modeling. This software combines concatenated, prerecorded phonetic sounds with the emphasis and intonation of a human voice. The new NWR voices debuted nationwide in May 2002. The budget/product line VIP belongs to is Voice Improvement Program (VIP). Due to the nature and timing of the program, VIP was implemented in concert with a major software upgrade to the Console Replacement Program (CRS). In FY02, the VIP program acquired and deployed a new commercial off the shelf voice system to improve the voice quality of NWR broadcasts. VIP replaced the "IGOR" voicing system with an improved male/female voicing capability. The next upgrade being planned is a Spanish capability. Future activities include expanding the VIP program to include technical insertion for all forecast office dissemination systems. RRS will replace the NWS network of obsolete radiosonde observing systems with a modern system that improves data availability and accuracy, operates within a reduced frequency spectrum, and is more efficient to operate and maintain. The current radiosonde system provides only a small portion of the data collected for distribution to users. These data sets do not contain sufficient detail to fully meet the needs of today's numerical prediction models. The replacement system will distribute high-resolution data sets and give users access to the full set of observed data collected by the system. The budget/product line RRS belongs to is Rawinsonde Replacement Program (RRS). The RRS is a total upgrade/replacement of all NWS rawinsonde systems. The RRS is being implemented for numerous reasons which include improved maintainability and reliability, enhanced operational performance of GPS technology, and the need for systems to operate in newly designated frequency ranges. Essential to the program is the development of new GPS- and RDF- capable sondes. Key components of the system include the Tracking and Receiving System (TRS), GPS/RDF sondes, ground weather sensors (RSOIS), and a system workstation with imbedded operational software. The CSTAR Program represents an NOAA/NWS effort to create a cost-effective transition from basic and applied research to operations and services through collaborative research between operational forecasters and academic institutions which have expertise in the environmental sciences. Â These activities engage researchers and students in applied research of interest to the operational meteorological community and improve the accuracy of forecasts and warnings of environmental hazards by applying scientific knowledge and information to operational products and services.